Office Space - Hathersage, Derbyshire. 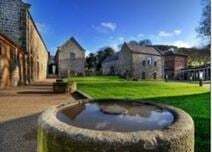 In the heart of the Peak District National Park, a twenty drive from Sheffield, this converted set of barns and coach house now marry together the peaceful and beautiful rural setting with the best technology. The outbuildings are now being converted into 13 offices of high standard. The rooms come fitted with fibre optic cable connection and high speed broadband. Trains run from local Hathersage railway station to Sheffield and Manchester, and local amenities include pubs and a hotel.